A mysterious and kindly old solicitor called Mr. Blunden pays a visit to recently widowed Mrs Allen and her children offering her the position of caretaker at a derelict country mansion. Struggling in their cramped London flat, they cannot refuse and soon arrive at their new home. More surprises are in store when the children not only encounter the ghosts of two previous young residents but also find themselves going back in time to help them right a 100-year-old wrong. This powerful British drama from the late Lionel Jeffries (an actor with over a hundred films to his credit whose first film as dirctor was the classic The Railway Children) is based on Antonia Barbar’s novel The Ghosts and stars a stellar cast of British acting talent including Laurence Naismith, Lynne Frederick, Diana Dors, James Villiers, Madeline Smith, David Lodge and the great Graham Crowden. The Amazing Mr Blunden was selected by Mark Gatiss as his neglected classic of the 1970s on Radio Four’s The Film Programme. Time Out said of the film: "Handled with that sense of enchanted stillness which is one of Jeffries' great gifts as a director, the apparitions, the apprehensions, and the atmosphere of brooding menace about the house are exquisitely done." 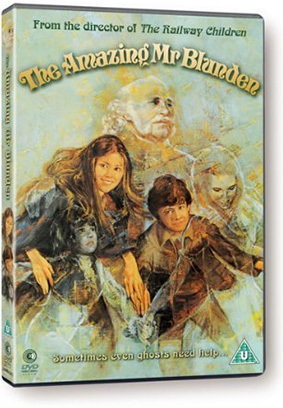 The Amazing Mr Blunden finally gets a long-awaited DVD release on11th March 2013 from Second Sight Films at the RRP of £15.99.